Breanne shares her and Mike’s big day–an island wedding full of romantic elegance. The talented designer Joanna August is in the business of dreaming up beautiful and innovative bridesmaid dresses. With a wide range of colors, styles and silhouettes, there’s something in Ceremony by Joanna August to make any bridesmaid happy (even jumpsuits!). Read on to see more dresses and some sage advice from the woman behind these pretty, romantic bridesmaid dresses. Your journey into bridal designs began with your own wedding in 2008 because you couldn’t find dresses you loved for your bridesmaids. What was missing from the market and what defines the look and style of your dresses today? In 2008, everything on the market for bridesmaids looked like a bridesmaid dress! Even the pretty ones would have some sort of detail, like a satin sash or satin piping–something that marked the dress “for weddings only.” Then, if you looked for “regular,” off-the-rack dresses, you would find the perfect dress but not in the colors you wanted. From the beginning, the look of my dresses has been romantic, ethereal and most importantly, wearable! 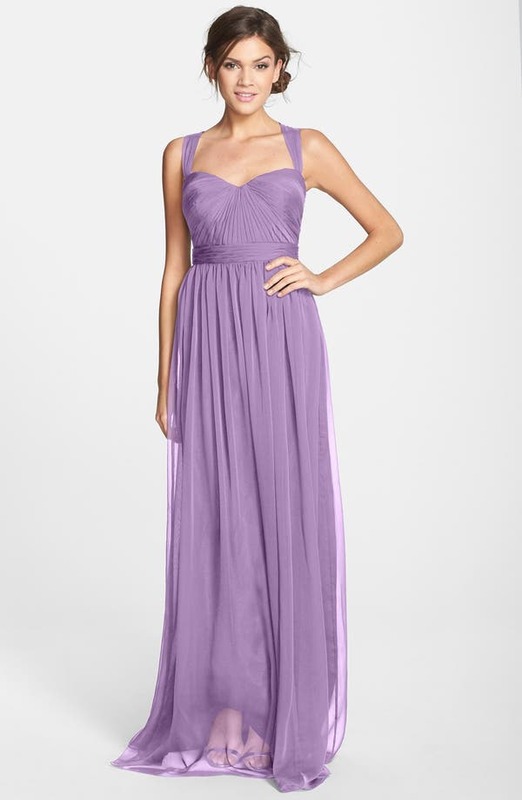 Nothing about my designs limits the dresses to the bridesmaid category. The only thing real “bridal” about them is that they are available in many colors, so the bride is able to customize the look to achieve her overall vision for her wedding. Now, in 2015, there are a lot more options for bridesmaids, so, while I continue to put out fashionable, wearable looks, I also focus on pushing the envelope and introducing new and unexpected options for bridesmaids. I was one of the first to design separates and jumpsuits for bridesmaids, and I continue to search for unique options for the fashion-forward bride to express her taste and creativity through her bridal fashion choices. Download and browse the entire Donna Morgan Serenity Magazine. 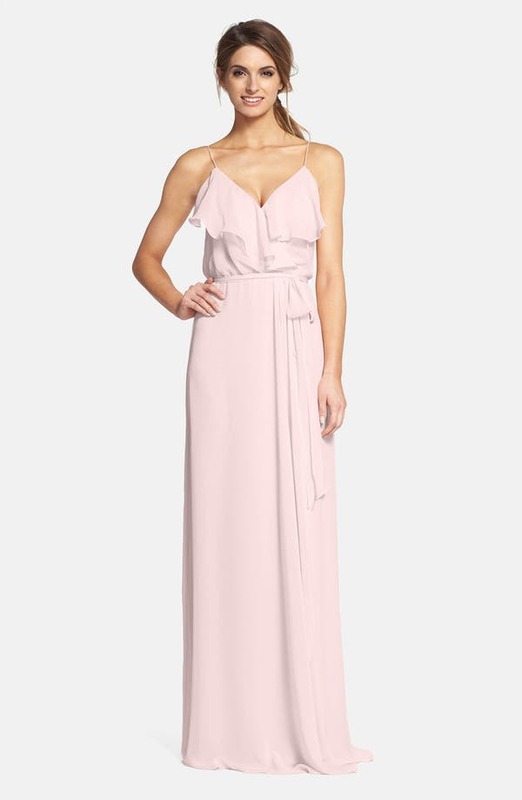 They’re Here: nouvelle AMSALE Bridesmaid Dresses! Now online and in selected stores: a new line of bridesmaid dresses from bridal designer Amsale Aberra. Created as a more affordable option to the original Amsale collection, nouvelle AMSALE bridesmaid dresses and wedding gowns are available at a lower price point–without sacrificing an ounce of beauty. We love the muted tones and flowing lines of these pretty chiffon dresses. Check out our six dress styles in six different shades–perfect for flattering a variety of body types and color palettes. $190–$220. Check back mid-April here on the Wedding Suite blog for more from Amsale! A lot goes into planning a wedding, including finding the perfect gowns for your bridesmaids. Here, two unrelated brides—Krista and Danielle—share their inspiration and the paths that led them to choose bridesmaid dresses from Donna Morgan in beautiful shades of green. The Bridesmaid Dresses: Like most brides, I leaned on Pinterest for inspiration throughout the planning process. After we selected our venue, I knew I had to choose a color palette. Pastels were something I was really drawn to, since they are so soft and romantic, and that’s how we envisioned our wedding. Since we loved the pastel color palette, we thought that having mint green as the main color of the wedding would be unique. Once we had decided on that, it was easy to narrow down the bridesmaid dress color, since the Donna Morgan line has so many shades available. I knew I wanted to mix and match the colors, because we had decided to mix and match ties for the groomsmen as well. I really liked the idea that everything at our wedding would tie together but not necessarily match perfectly. I was also able to get color swatches of the dresses from a Nordstrom store, which was so helpful in making my final decision on the color, and I ended up with a mix and match of the colors Apple Tart and Spearmint. I was very flexible with my bridesmaids. I told them the colors I liked and then let them choose whichever Donna Morgan neckline they preferred. There are so many necklines, which all look different on different body types. It was really important to me that my bridesmaids felt comfortable and pretty on our big day, so I wanted them to pick what they felt confident and pretty in! Your Wedding Suite Experience: I chose Nordstrom for a number of reasons. First, not all of my bridesmaids lived in the area, so coordinating a shopping trip was not going to happen for us. Choosing Nordstrom would let them all go and try on dresses and choose their style on their own, or receive free shipping if they didn’t live near a Nordstrom location. Also, I knew that if there were any issues with the sizing, they could return them without a hassle—or the girls could get them altered in store and they would be treated well. Final Thoughts: Looking back at my pictures, I can tell that each of my bridesmaids felt as pretty as I did! 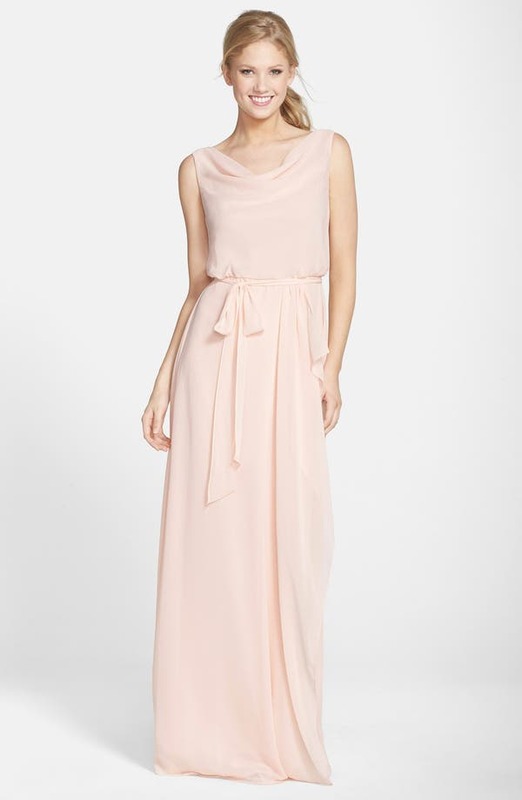 The Bridesmaid Dresses: I wanted a color to complement coral (my first color choice) and gold (my accent color). I started to see this color combo (mint + coral + gold) early in 2014 and LOVED how it looked! I liked the classic look of one color for bridesmaid dresses (mint), but I ended up doing shades of sage and mint for my flowers and design details of the wedding. I ended up doing shades of coral/peach/pink-orange for my flowers to add depth. I knew what I wanted from the beginning—Donna Morgan was my designer of choice. She’s a great designer and the dresses are great quality. After that, I let my bridesmaids decide on style; I just requested that it be something long and have a “hint of mint,” because I loved how it looked in the sample I saw. The gals ironically all went with the same dresses and neckline because they just loved the style. Final Thoughts: Looking back at the photos, I love seeing how the bridesmaid dresses brought the whole picture together. The color (deeper than my white dress) gave a fresh, romantic look to our wedding. I can’t begin to rave how much I loved the color and overall look of my bridesmaid dresses. And a note about Nordstrom. I knew I would get service, quality and style there. I have been a loyal Nordstrom shopper since I was born. 🙂 My mom (since retired) worked for the company for 25 years. Nordstrom is still my go-to department store for basically everything I wear! Did you find your wedding gown at Nordstrom? We love a good wedding story! E-mail Nordstrom Wedding Stories for details on getting your wedding featured on our blog. And for more inspiration, make a complimentary appointment with a Wedding Stylist or browse our Wedding Suite. To celebrate the arrival of the spring 2015 collection for BLISS Monique Lhuillier wedding dresses, we caught up with the designer behind the brand. We just couldn’t miss an opportunity to chat about her gorgeous bridal gowns (and bridesmaid dresses! ), the risk she recommends brides take and her favorite thing about being in the bridal business. The Wedding Suite: Tell us three things we would be surprised to know about you. 1. I started my bridal business after looking for my own wedding dress almost 20 years ago, because I felt there was a void in the marketplace for fashion-infused dresses. 2. I love the outdoors. I am from California, and I love hiking and spending time with my family in the sun. 3. I’m half French and half Filipino. What’s the most important thing about designing a wedding dress? For me, my bridal gowns must emanate romance and fantasy. I offer all different types of dresses that will make a bride feel glamorous and alluring on her wedding day. When designing, I focus on the gowns feeling very feminine, marked by exquisite workmanship and luxurious fabrications. What’s distinctive about your new BLISS collection; what sets it apart? I subtly infused color into this collection. I wanted a beautiful pastel color palette including tones of pale blush and latte all mixed with soft silk layers, white tulle and lace. You’ll find exquisite design details: beautiful combinations of Chantilly lace with overlays of draped tulle and delicate embroidered lace appliqués in addition to cascading hemlines edged with horsehair trim. How does BLISS differ from your namesake collection? BLISS Monique Lhuillier is inspired by a feminine, elegant and youthful bride. This collection provides a curated collection of romantic dresses that are punctuated with fresh styles that embody my signature design aesthetic. I provide distinct silhouettes—from stunning trumpet-shaped gowns and ethereal sheaths to whimsical ballgowns—all at an accessible price point. What is one bridal fashion risk you would recommend to brides? Experiment with color on your wedding day. I love pale pink or blush for a touch of the unexpected; it can be quite enchanting for brides who are looking for something nontraditional. What’s different about designing a bridesmaid dress versus a wedding dress? The process is quite different, and I actually look to my ready-to-wear line for inspiration. Bridesmaids want to feel beautiful, comfortable and even a bit fashion appropriate when they are walking down the aisle. I try to provide dresses they could wear again for a special occasion and offer colors that will complement them. What advice do you have for brides as they choose their bridal parties’ wardrobe? The process of choosing your bridesmaids is hard, but finding a dress they will all agree on is sometimes even harder. As the bride, I think it is necessary to set the direction for what you want your bridesmaids to look like on your big day. The more guidance they have, the less likely they are to go astray. This means giving them hair and makeup direction, accessory parameters and, most of all, very specific information on what you want in their dresses. It’s important to select a bridesmaid dress that fits into your color scheme, but it’s most important for your bridesmaids to feel beautiful and at ease. Selecting one color is the easiest way to have a cohesive look; then allow the bridesmaids to select the style they are most comfortable with. What’s your favorite thing about being in the bridal business? The bridal business is rewarding because it all revolves around such a special day. To have the opportunity to make a bride feel beautiful, confident and glamorous on this momentous occasion is such an honor. Back in December, we gave you the scoop on why co-founders Lauren Conrad and Maura McManus created their gorgeous line of bridesmaid dresses, Paper Crown. And now, seven styles in a number of muted pastels and neutrals are ready to ship and outfit your equally gorgeous maids. When planning their own weddings, real-life besties and Paper Crown co-founders Lauren Conrad and Maura McManus were having a hard time finding the perfect bridesmaid dresses. Their solution? Design a bunch they love themselves! So was born Paper Crown Bridesmaids. We love them too, and these dresses full of flowy romance are now available for pre-order. On her motivation and philosophy, Conrad tells us, “Designing the Paper Crown bridesmaids collection was a dream! My goal was to design dresses that flatter a variety of body types. This way, a bridal party can look cohesive but not necessarily have to be wearing the exact same style. Everyone should feel great, just not better than the bride, of course!” A bride’s supporting cast should definitely look and feel great—we think you could say that about these ladies and their gorgeous dresses in action. We have Paper Crown by Lauren Conrad in six silhouettes and a number of pretty pastels and muted tones. Dresses will be available to ship the first week of February. Vanessa recounts her and Jon’s May wedding at the Renaissance D.C. Downtown Hotel in the nation’s capital. My Vision: The reception venue was modern and sleek but still warm and inviting. This modern look lent itself well to the D.C. vibe we were trying to achieve, as well as a less formal feel to the reception. For example, we did not have a traditional sit-down dinner; rather, we incorporated live-action stations in our reception ballroom, which included a mashed potato bar, a crêpe station, and a crab cake station. Finally, we had a photo booth that was a hit with our guests—such a fun experience, and it also doubled as our wedding favor. Overall, we wanted our guests to enjoy a great party with delicious food and drinks and have FUN! The Scene: When we were planning for our wedding, an issue was that my family was scattered across the Northeast, while Jon’s family was situated in Seattle, WA. Our closest friends live in the D.C. metro area. Ultimately, we decided to have the wedding in Washington, D.C., as it is a location that both families could travel to and one that our friends could easily get to. Moreover, we hoped that our out-of-town guests would take advantage of their D.C. visit to check out the monuments and other historic sites! St. Dominic’s is a breathtaking church that provided a serene setting for us to exchange our vows. We visited many potential reception sites to follow up the ceremony with before deciding on the Renaissance D.C. Hotel. However, after our first meeting with an event coordinator at the Renaissance, we felt excitement: something we hadn’t felt with the other venues we’d visited. As the event coordinator showed us around the hotel, Jon and I could see our wedding playing out, details and all. We loved the modern yet inviting feel of the hotel as well as its central location in D.C., for both out-of-town and local guests. The coordinator was also inviting—her warmth was evident, as was her love of planning weddings. Jon and I knew we wanted to work with a coordinator who saw our wedding as unique and would put as much care into it as we were. Special Moments: Our favorite moment took place right before the ceremony began. Jon was in the back with our priest, Father Schommer, talking through the ceremony logistics and running down the list of items to check off, as they were waiting for the clock to hit 2pm. They heard Jon’s sister singing and the organ playing, and then Fr. Schommer asked about our cantor (the chief singer employed by the church). He asked if Jon had seen him around. They discovered that neither of them had actually called the cantor. When they did, they found out that he was sitting on his couch at home! The chief singer who we had worked with for 8 months had forgotten about our wedding. Fr. Schommer made a quick announcement to the congregation that there was a 5-minute delay, and that we were “waiting for one of the musicians.” He asked the organist to please continue to play music. This was at 2:01pm. Fr. Schommer was a quick thinker, and he went through the ceremony songs and figured out which of them he could sing and which he couldn’t. In a minute or so, we had it figured out, and were ready to go. At about 2:05pm, Fr. Schommer walked out of the sacristy (the area behind the altar), onto the altar and quickly came right back. He said to Jon, “Vanessa is coming down the aisle!” The wedding party and I didn’t hear Fr. Schommer’s announcement of the delay, as his microphone speakers didn’t reach the vestibule (the area that the wedding party and I were lined up ready to process in). On top of that, the filler music being played by the organist was the processional music I was meant to walk down the aisle to. With all that confusion, the wedding party started to process in… without Fr. Schommer or Jon at the end of the aisle. Fr. Schommer asked Jon to wait for a minute so that I could get down to the end of the aisle, and then waved Jon out. There was a roar of laughter, and made this moment truly memorable and unique to our wedding. My Dress: I found my wedding gown at the Tysons Corner Wedding Suite in McLean, VA. There couldn’t have been a more perfect gown to suit my style and my wedding day in the nation’s capital. My wedding stylist, Maria, called me for my first consultation in June 2013. Knowing I was petite with curves, she suggested designs by Matthew Christopher. His ‘Moet’ gown was the second gown that I tried on when I had my first appointment with Maria, and I immediately fell in love. I tried on a few more gowns just to be sure, but each one couldn’t compare to ‘Moet’—it sealed the deal for me. I purchased my Nina wedges, Nadri earrings, Nina veil and Nina clutch from the suite as well. I also found the bridesmaid dresses and flower girl dress at the suite! The Wedding Suite: Maria and the Wedding Suite team made my shopping and alterations experience incredible, from the day I purchased my gown to my last fitting. Not only were they organized and detail-oriented; they were also warm and caring, making my wedding experience that much more memorable. I didn’t feel like just one more bride walking through the suite. Rather, I felt my experience was unique to Maria and the team. Eva shares the tale of her and Jeff’s May wedding at Windows on the River in Cleveland, Ohio. My Vision: I wanted a simple and enjoyable day. It was all about gathering with loved ones and having a great time! My goal was to create a day that Jeff and I could celebrate with all our favorite people without feeling stressed and crazy. I wanted to take in the special moments as they happened, so I would have amazing memories. I wanted to keep with certain traditions but also to make our wedding unique and perfect for the two of us. At the end of the day, everything was without flaw, and we all danced the night away! The Scene: It was a beautiful, sunny, 70-degree day in Cleveland. The room that held our ceremony and reception had high ceilings and tall windows that let in the natural light and provided gorgeous moonlight in the evening. The exposed brick and other architectural features made it the perfect place to display the fresh floral arrangements and romantic colors we had chosen. Jeff and I had our first look outside the venue under an old stone bridge. It was a sweet time that we shared alone, before all the festivities really began. Jeff finally saw the dress that I had been anxiously waiting for him to see me in, and he was so handsome in his new blue suit. The ceremony was emotional and heartfelt as we shared our vows we had written to each other. We started the party off with cocktail hour outside on the patio as we listened to a live pianist with a view of the city in the background. There was delicious food, tear-jerking toasts and all kinds of dancing. The best moment for me was standing back and seeing all the happiness and love around us and between us as the realization of our perfect day set in. Every little thing came together, and the two of us could not have been more thrilled. 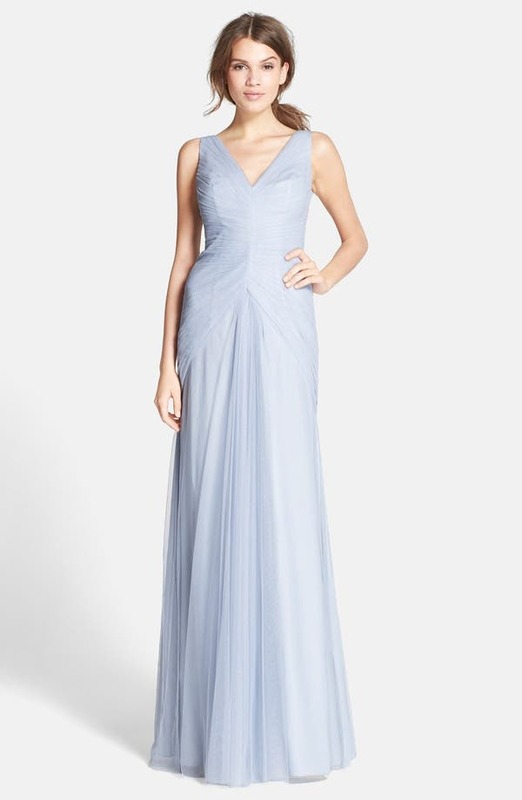 My Dress: The team at the Nordstrom Wedding Suite was great in helping me find my gown and making it perfect. I went to the store for a Hayley Paige trunk show without any expectations of finding my dress on my first shopping trip. I had an open mind and wanted to try different styles to see what suited me. I was so excited with what Nordstrom had to offer, and my stylist helped me try everything I had in mind. She did a great job of making me feel comfortable and special as I quietly analyzed each dress. After trying on about seven dresses, I tried the Hayley Paige ‘Guindon’ gown, and although it was interesting and fun, it did not make a great first impression. I took it off and moved to another. After thinking on it, I went back to the ‘Guindon’ to give it another try. After I explained that I loved everything about it except for the stripes, Hayley told me she could make it without the stripes. I was sold! The Wedding Suite: When it came to finding dresses for my bridesmaids, we loved the Amsale collection because the dresses came in so many different colors and styles. We picked the blush pink color, and then each bridesmaid chose the same dress in a slightly different style. 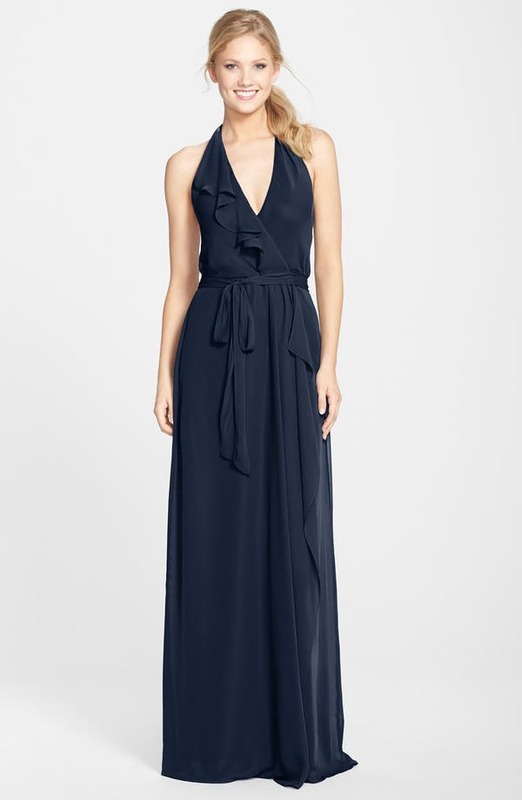 The dresses were definitely the look I was going for, and I was glad to have found them at Nordstrom. The process of fitting the dress was great, as I had complete trust that the alterations would make it just right. Natasha altered the dress so that it fit me perfectly. It was convenient being at Nordstrom and having the lingerie department so close. The manager came down to help me find a bra that would best work with my dress. The experience of going for fittings was exciting, as I couldn’t wait to get back into my dress each time!